Every year, more and more small businesses start a content marketing strategy, and for good reason. Over time, content marketing (aka “inbound marketing”) costs 62% less than outbound marketing tactics and generates over 3 times as many leads! At the heart of most small business content marketing strategies is a company blog. 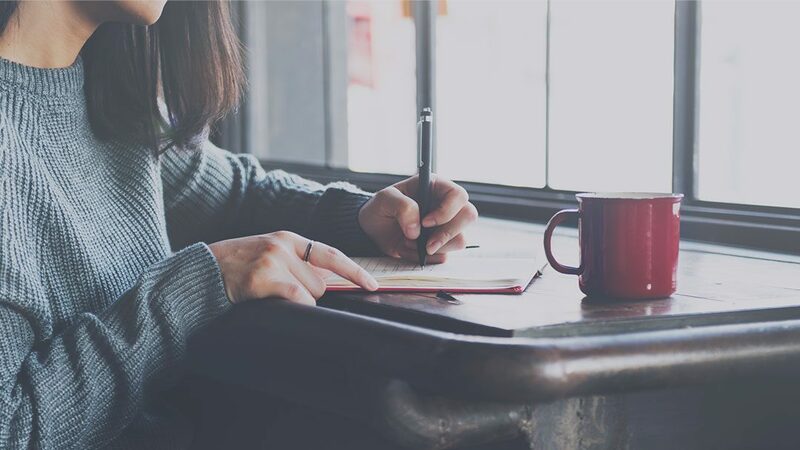 In this article we share our top small business blogging tips; from picking the right topic to promoting your blog after it is complete. 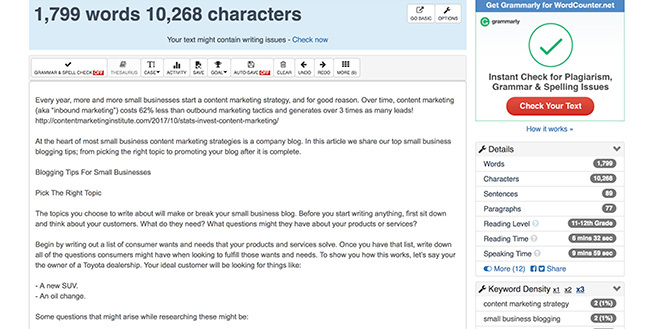 The topics you choose to write about will make or break your small business blog. Before you start writing anything, first sit down and think about your customers. What do they need? What questions might they have about your products or services? What are the most fuel efficient SUVs? Why have your oil changed at a dealership? Demonstrating the fuel efficiency of the new Toyota Highlander Hybrid. Explaining the differences in service level between a dealership and a local garage. If you’re looking for some more inspiration, here are some blog post title templates to get you started. Now that you have a great headline, it is time to start planning your content. The best way to do this is to start with an outline. A list of your major points. Once you’ve written everything out, organize your major points in a way that will allow you to smoothly and naturally flow from your intro to your conclusion. One of the hardest parts about writing a blog post is organizing your ideas in a way that makes sense. Having a basic outline lets you know where to start, and where you want to end up. It also help keep you on track by showing you what your next point is; allowing you to smoothly transition between each point. Although you may be an expert in your field, most people reading your blog will never have heard of you. Backing up your opinion with real data will help to build credibility with your readers and establish you as an authority in your space. Linking to reputable outside sources is also good for your SEO. It shows search engines that your content is properly researched and thought out. If you include facts and figures, quotes from people in your industry or mention a specific article, be sure to include a hyperlink to the source material. This will not only help your SEO, but also show your readers that the data you’re referencing hasn’t been made up just to prove a point. When it comes to word count, size matters. One of the biggest mistakes we see small business blogs make is writing posts that are too short. 300-600 word articles are simply too short to fully explain most topics. If your blog doesn’t fully answer your reader’s question, they will find another one that will. Search engines also do not like short articles. Simply put, the longer and more depth the article, the more long tail keywords it will have, and the better its SEO will be. To make sure that you get your point across, and improve your SEO, make sure that your blog posts are at least 800-900 words long. To really maximize the SEO of your blogs, aim for post that are somewhere between 1200-1500 words long. Bonus blogging tip: Not sure how long your blog post is? Go to wordcounter.net. This free tool will tell you how many words your new post is, as well as how often your chosen keywords show up. Wordcounter is a free online tool that shows you how many words your article is, as well as other stats like how hard it is to read. Try to include your keywords in prominent areas of the post, like in the title of the post and the main headings. They should also appear at both the introduction and conclusion of the blog. Doing this will properly introduce the topic to the reader at the start and reinforce it as they finish reading. While keywords are important for SEO, you don’t want to overdo it. Excessively adding keywords to improve your SEO (aka “keyword stuffing”) no longer works. In fact, search engines now actively punish this practice. For best results, only add in keywords where they naturally fit into your content. The simple truth is that the better your content is, the more people will want to read it. Your main focus when writing your blog should therefore be your reader. What information will they find interesting? What are they looking to learn from this content? Answering these questions will go a long way towards improving the quality of your content in the reader’s mind. You should also keep in mind that your readers will likely know much less about the subject that you’re writing about than you do. Try to keep your content as simple as you can. Try to keep industry terms out of your posts as much as possible (unless the term is important to the post and you first take the time to explain what it means). Keep readability in mind when writing your content. Keep your sentences short (most of them should be under 20 words) and your paragraphs short (try for no more than 3-4 sentences per paragraph). Each heading should contain no more than 300 words. If one of your headings has more than 300 words, try subdividing it into 2 or more subheadings. Breaking up your post into headings and subheadings not only makes it easier to digest for your readers, it also helps them quickly scan your article. A lot of blog readers today don’t actually read full posts; instead skimming through and reading only the parts that interest them. Having clear headings allows them to more easily find what they came for. Another great way to improve the readability of your posts is by adding bulleted and numbered lists. They help to reinforce your points. People are predominately visual learners. Adding in images can therefore really help your readers absorb what you’re writing about. They break up blocks of content and make your blog more readable. Search engines love images and will boost the SEO of posts that contain them. Bonus blogging tip: If you do add images, make sure that you name them properly. Accurately naming your images let search engines know what the image is about. If the image name fits in with the keywords in the rest of the post, you will receive a slight SEO boost. For example, if you have a picture of a golden retriever, naming the image something like “golden-retriever.jpg” will help your SEO a lot more than leaving it as something like “IMG-017356.jpg”. Finish off your post with a quick summary of the article. A growing number of blog readers now first to the end of articles to see if it is worth reading. A strong conclusion not only reinforces your main points for people that have read the article, it also “sells” the article to people who have just briefly skimmed it. Read these related articles for more information. Sign up for our next webinar. Call us today to help you solve this problem. The more articles of yours a person reads, the more familiar they get with your brand and the more they start to look to you as an authority in your space. As your familiarity and authority grows with your reader, they become more likely to convert into a customer. One of the top priorities of your content marketing strategy should therefore be how to get your readers to read more of your content. The easiest way to do this is by linking related posts together. When publishing a new post on your website, try linking it to as many of your other posts as possible. Related articles can be linked together with simple hyperlinks or with a dedicated “related posts” section at the bottom of your page…or both! “Related posts” are a great way to encourage people to read more of your content. Sharing it to your social media followers. Including it in your e-mail newsletters. Posting it on relevant online forums and social media groups. Along with promoting your content yourself, you should also make it easy to share so that your readers can promote it for you! The best way to do this is by adding social sharing buttons to all of your articles. These buttons allow your readers to share your content with a simple click and can dramatically increase the number of times your content gets shared. Adding social sharing buttons is a great way to increase the reach of your blog. If you use a CMS like WordPress, Wix, or Drupal this is usually fairly easy to set up. For help adding social sharing buttons to your site, give us a call. We’d be happy to guide you through the process of setting them up o your website. Our last small business blogging tip is both the simplest, and the most important; be patient. Content marketing can take a long time to pay off. In fact, it can take anywhere from 6-12 months before you start to see results and up to 3 years to really see the full benefits. While it may sometimes seem like you’re banging your head off of a wall, be patient. Results will come and one day your content will likely be your best source of new business! When done correctly content marketing is one of the best, and cheapest, ways to market a small business. Following these blogging tips will help your new (or existing) content marketing strategy flourish.